ODU AMC® | High-Density for Challenging Applications! The spread of ebola in West Africa and the emergence of isolated cases in Western and other countries has caused widespread alarm. Cristanini S.p.A has closely followed the emergency, being a supplier of decontamination systems, but before considering potential equipment solutions, it is appropriate to set the ongoing biological outbreak in context. In the case of Sierra Leone and Liberia, still fragile following brutal civil wars in the 1990s and early part of this century, the current outbreak represents a second humanitarian tragedy, but of contrasting effects. While civil war saw massive internal displacement and flight across borders into neighbouring countries, the current crisis has invoked the complete opposite – the lockdown and quarantining of people, with a number of neighbouring countries closing their formal border crossing points, the cessation of international flights by others, visa restrictions and screening of passengers at airports, all depending on the perception of risk from country to country. Both crises resulted in critical damage to already fragile infrastructures and both engendered the same response – fear; but in this case a fear that has spread well beyond local borders to all governments and an increasingly concerned global audience. The internal medical infrastructure to deal with this second crisis was wholly inadequate, supported by international and humanitarian aid agencies who were there to address existing challenges, not a crisis of this nature or proportion. It is widely acknowledged that, despite the warnings, the international response has been ill-equipped and too slow, just as the overall preventive measures in developed countries has been inconsistent. It is not the first time that ebola has emerged; there having been outbreaks in East and Central Africa in the past, but these were contained, however they occurred in places that were largely remote, easing the challenge. Clearly, once such a virulent virus reaches major population and communication centres, those challenges become substantial and so ‘we are where we are’, hoping that containment is effective, while eagerly awaiting all the lessons to emerge. In the short term, the fight is to provide support to life, contain the outbreak and, crucially, provide preventive information to the populations concerned, including the overcoming of cultural taboos and finally, to support those individuals in the international and non-government organisations who are courageously responding to the crisis. In the longer term, it is clear that greater preparation and coordination is required to ensure a swifter and a more consistent response. RI CBRN Trailer and LVD-X. Within Defence, we are largely concerned with the deliberate release of warfare agents or toxic industrial materials, but with biological release we are faced with a conundrum as many potential warfare agents occur naturally. Even with an outbreak that one may assume is naturally occurring, Defence has always taken a keen interest; in this ongoing episode US and UK forces are responding to provide greater containment of the crisis at source, just as a UK brigade was deployed internally to support the eradication of foot and mouth disease in 2001. The current deployment of forces to Liberia and Sierra Leone also comes against the backdrop of complex and ongoing security issues within the region. Decontamination is sometimes considered the lesser of the pillars of CBRN protection – doing the washing up has always been regarded as a bit of a chore, but you need decontamination to prevent an event becoming a crisis, not only to support an emergency that is ongoing. So, while the company prepared a series of ebola response options, we were pleased to see our systems being employed in Brazil when a suspect case returned from the Republic of Guinea and developed early symptoms of the fever. He was flown to a specialist isolation unit in Rio di Janeiro which allowed testing and specialist care. Cristanini equipment was employed in the decontamination of the aircraft. Two principal equipments were deployed to the airfield: a Rapid Intervention CBRN Trailer and LVD-X; the latter for decontamination of interiors of aircraft, headquarters buildings or the interior of multiple types of infrastructure. Cristanini’s Rapid Intervention Trailer offers a truly multifunctional capability. The system decontaminates personnel, vehicles, equipment, external infrastructure and terrain. 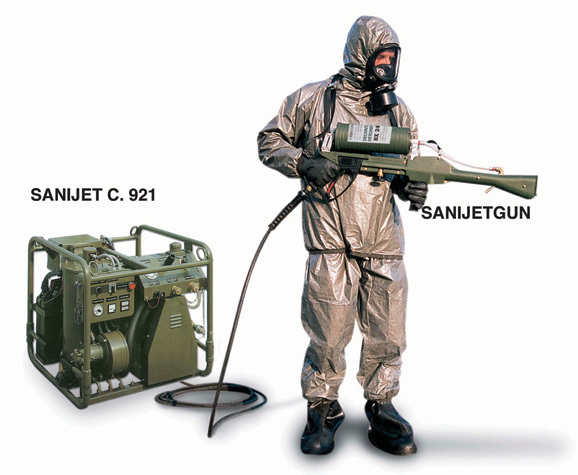 Equipped with the Sanijet decontamination machine and its eye-catching Sanijetgun, BX24 universal decontaminant, BX40 decontaminant especially for aircraft exteriors, as well as numerous accessories, it provides rapid intervention in the event of all CBRN emergencies, as well as preventive solutions. Extremely simple to operate, it can deal with a host of different CBRN, toxic industrial and environmental waste management contingencies. It operates with its own integral water supply or water drawn from multiple sources (fire services, hydrants, bowsers, rivers, lakes, the sea). The trailer operates on multi-fuels (diesel, kerosene and JP8), has its own integral generator, is completely autonomous and comes in red, green or sand colour. 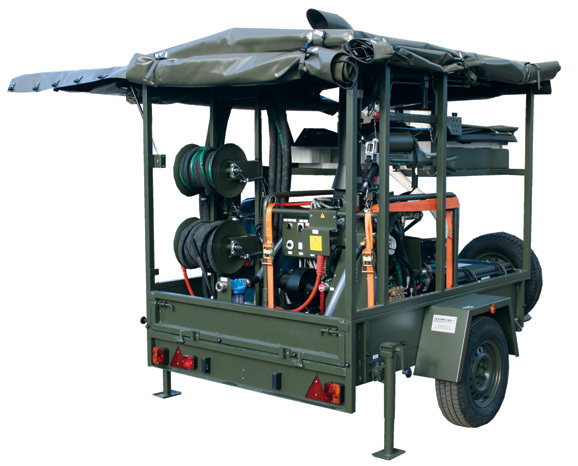 The company’s Light Trailer is also completely autonomous and multi-functional, providing a shower system for personnel as well as a wide array of surface and terrain decontamination options. LVD-X decontaminates chemical and biological hazards in the air and on the surfaces of critical infrastructure including rooms and aircraft. It dispenses a mist of atomized micro-droplets of chemical and biological decontaminant that is lighter than air, and can also be discharged through a buildings ventilation system. Once deployed it can be operated in an autonomous mode, cycles being fully automatic, or controlled by a single operator. The machine also offers decontamination of other surfaces using a spray lance and the universal decontaminant BX24. The BX24 is automatically mixed with water and is environmentally friendly. After manual application and a brief waiting period, the now detoxified residue can be rinsed away. Cristanini’s SX34 is another item that proved useful for decontamination of sensitive equipment such as the aircraft control panels. Equally, it can decontaminate any sensitive surface, such as aviation, search and rescue or expensive medical equipment. This portable equipment involves the non-aqueous mechanical removal of chemical, biological or radiological agents to a receptacle where they can be detoxified by BX24 or, if radiological, secured for disposal in accordance with national and international safety regulations. Finally, the company is unique in supplying a Level 3 autonomous chemical and biological laboratory that is specifically designed for field deployment into harsh environments. It can deliver forensic level results to support strategic decision making, medical counter measures or a criminal enquiry. All these items of equipment follow the Cristanini philosophy of providing universal solutions for multiple scenarios, whether defence or civil protection; useful when you don’t know how, when or where the next CBRN crisis is going to reveal itself, whether natural or intentional. The current crisis has seen practically every suspect case outside West Africa achieving strategic effect in featuring on both national and global media around the world, in breaking and rolling news. CBRN has always been officially regarded as a low probability but high consequence, dare one say, catastrophic event. That is not far removed from the public perception and were ‘an outbreak’ to take root in the developed world the social and economic consequences would be dire. The current and ongoing emergency has been a firm reminder to all of us to consider our resilience in the event of a CBRN crisis.